Historically in the church forgiveness has generally been connected with individual practice, while the significance of forgiveness in the public arena has largely been eclipsed by emphases on more retributive understandings of justice. Yet interest in forgiveness is increasing in a number of spheres, encompassing both the personal and the public. Forgiveness is a journey. Today you can forgive and tomorrow you can feel the pain all over again. Is the Church missing a trick by not getting behind these kinds of projects with more energy? Historical-criticism has been the dominant approach in biblical interpretation since the mid-nineteenth century until the 1970s. It has long been taken for granted as “the only scientifically respectable way to study the Bible,”1 in the English speaking world at least, but “is now under a cloud.”2 In contemporary biblical studies the number of approaches to interpretation are legion, and with so many of them seeking to consciously reject the historical-critical approach we must look carefully at the role it has played, and continues to play, asking whether it has not “been falsely demonised in the process.”3 This essay will evaluate key aspects of the philosophical, methodological and theological outcomes of historical-criticism and argue that it continues to provide invaluable interpretive tools when handled carefully and intelligently. It is very difficult to do justice to the fact that there is no such animal as the historical-critical method. Some have tried to categorise the multifaceted nature of it. For example, Plantinga distinguishes at least three distinct types of historical-criticism: ‘Troeltschian’, ‘Duhemian’ and ‘Spinozistic’.4 In the interests of brevity, however, it is simply worth noting that to use the term ‘historical-critical method’ is in itself “something of a misnomer to describe a complex set of attitudes and assumptions.”5 As Barton rightly points out, the prospects for and role of historical-criticism will depend largely on what definition we prefer to attach to it6 and that it is an approach that is far more nuanced than many of its critics will admit. In the last thirty years the philosophical underpinnings of the historical-critical method and the historian’s ability to reconstruct the past have been seriously brought into question. The historical-critical approach emphasises the discovery of the historical context(s) in which a text was written and subsequently added to. It claims that to discover the meaning of a text it is first necessary to identify the authorial intent, which can be determined only by closely aligning oneself with the historical background behind the text. Often presented as “the correct method for getting at the meaning of the text,” it also risks taking the scriptures out of the hands of the non-specialists.7 This is perhaps ironic considering that historical-criticism arose, in part, as a response to the church’s dogmatic authority only to replace it with a dogmatism of its own. Dobbs-Allsopp rightly discusses the need to rethink and retheorise the objectivist and foundationalist assumptions that have informed and motivated the historical-critical practices of the past.8 Historical-criticism, in its quest for the ‘original meaning’, values what Barton describes as “disinterested scholarship.”9 This quest for ‘what really happened’ assumes that the historian can have unbridled access to the facts without tarnishing it from their personal views, interests or wider Weltanschauung. 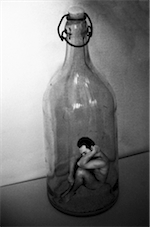 Yet thinkers such as Martin Heidegger, for example, have forced us to take seriously the role that preunderstanding plays in the process of interpretation.10 As readers, we do not approach texts as a blank canvass, but rather our existing understanding is adjusted to integrate new ideas and perspectives. None of us read in a vacuum; “everyone has an axe to grind”11 and our ability to ‘know what happened in the past’ is to some degree at least socially and culturally determined. On the contemporary scene, deconstructive readings that have chosen to view texts consciously through a particular lens (post-Holocaust, ethnic, post-colonial and so forth) help us to recognise how texts can be heard, regardless of their intended meaning, and can also jolt us “out of comfortable half-truths to see something which is really there in the text and to which we had not previously paid attention.”16 Miller, for example, helpfully points to the androcentric nature of much of the ancient cultures (and indeed the biblical archaeology that uncovers them) that feminist perspectives have revealed and brought into the contemporary consciousness.17 This is useful in discouraging any approach that claims to be value-neutral but may actually be, as one critic has described, enabling the theologian to smuggle their “commitments under cover of dark.”18 As Long has observed, “we will be able to be more objective only if we learn to conceal our subjectivity less”19 and learn to see our interpretive role in dialogical, rather than objectivist, terms. This predilection for the atomisation of texts finds its epistemological roots in the spirit and legacy of Enlightenment rationalism, with a Kantian tendency to separate knowledge into ‘aesthetic’ and ‘useful’ categories whereby religious language, often metaphorical rather than scientific in nature, thereby becomes suspect. Alter even speaks of the ‘hidden imperative’ that “the more atomistic, the more scientific”21 which in turn devalues the ‘final’ canonical text. There is undoubtedly some truth to the caricature that, for historical-critics, “often the finished product seems to be of less interest than the underlying sources”22 and that they are “frequently ill-equipped to appreciate the ‘literariness’ of the texts.”23 Whilst by no means exclusively the case, the historical-critical approach’s primary methodological tools are at times in danger of elevating the diachronic over the synchronic biblical text. Any hermeneutical method that cannot strike a balance in this area will always be self-limiting in its usefulness. Whilst the foundational assumptions on which this trend within historical-criticism can be questioned, however, Sternberg points us towards the fact that “the task of decomposition calls for the most sensitive response to the art of composition.”24 These analytical tools, appropriately used, can lead us to eminently useful questions and tentative conclusions about the ‘final’ text as we have it. Whilst studies of these kinds have undoubtedly led some to question the unity of the Bible, this in itself is no reason to debunk the historical enterprise as unhelpful and unnecessarily ‘academic’. What it does do is challenge us to rethink and reformulate what it means to describe the scriptures as a unity. This strand of thinking regarding the reformulation of texts raises a wider point, and common criticism, of the historical-critical method – namely, its appreciation of the Bible as Holy Scripture and its ability to formulate a theological meaning to texts. If the historical-critical method does not, primarily, appreciate the fundamental nature of the Bible as scripture then one can rightly question whether it should have ever held the ‘dominating position within biblical interpretation’ it once did. Seitz argues that historical-critical study “plays no positive theological role whatsoever,” but merely plays “a necessary preliminary [and] preparatory function.”25 Goldingay rehearses this argument by pointing to the fact that historical-critical interests centre on topics on which the text does not overtly focus. 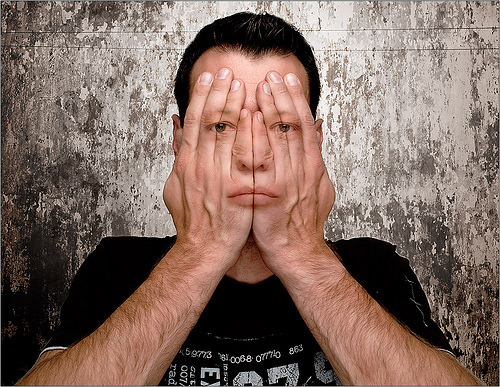 Therefore, it “misfocuses the interpretive task [and] cannot directly help exegesis,”26 thereby leading to a reductionist approach to the scriptures. Where theological concerns jostle with interesting historical, textual, grammatical and literary issues, it is often at the cost of the theological. These claims are at least partially true. Polzin rightly alerts us to the danger of making the primary object of study the pre-text rather than the text, through the desire to “excavate behind it to its hypothetical earlier forms.”27 Establishing the historical events that lie behind the story does not “in itself establish the story’s meaning… [and thereby] fails to realise the text’s own aim.”28 The biblical narrative and the meaning within it rest on far more than its historical facticity. German New Testament scholar Stuhlmacher took the view that historical-critical exegesis is not “in and of itself [a] theological interpretation of scripture”29 but can be when approach with a ‘hermeneutic of consent’ to biblical texts which is marked by “a willingness to open ourselves anew to the claim of tradition, of the present, and of transcendence.”30 To downgrade historical-criticism to Seitz’s ‘preparatory function’ is to assume that a theological hermeneutic is a ‘stage’ within a larger process rather than something that must inform the interpretive process throughout.31 Stuhlmacher’s ‘hermeneutic of consent’ usefully emphasizes the role of the interpreter’s conscious use of the tools within this process, flagging the need for them to be aware that the way in which they use hermeneutical tools is of high import. Historical-critical methods can therefore play an important role in determining the theological or spiritual meaning(s) of texts. One would be uncomfortable with any attempt to detach the ‘timeless message’ of scripture from its original world and context. A key implication of its ‘timelessness’ is not only that it can speak beyond the context in which it was written, but also that it is not ‘timeless’ in the sense of being “without historical rootedness.”32 The fact that scripture is a collection of historical works, written by human authors, invites us to approach them historically. This author has sympathy with those who claim it is also a misunderstanding of historical-criticism to assume it originally ever intended to stop at the level of historical enquiry. Dobbs-Allsopp, for example, claims that historical-criticism was “initially intended to inform us about the literary text itself and only secondarily about the history and religion revealed in that text.”33 Historical-criticism is concerned with more than just historical facticity – it arose in the period of rationality to deepen the roots of spiritual life. Thoughtfully applied, therefore, it can also be seen as a literary, as well as historical, method of biblical interpretation. Arising in the period of rationality, an undeniable achievement of the historical-critical method has been to make us aware of the historical and cultural location of the biblical texts,34 shedding new light and fresh perspectives on scripture as well as bringing into focus what Soulen describes as the humanity of the scriptures. It has deepened our conception of the historical context of the biblical narrative by attuning us to the multi-contextual nature of the religious, economic, political and ideological concerns across centuries of Israelite history. It also has served to make us sensitive to the “genre, setting and audience that separate different stages and elements of biblical literature.”35 At times it has provided a framework to question traditional beliefs or understandings that were unjustified. 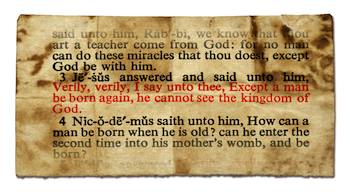 For example, it has been a tool that has enabled us to question, with good grounds, whether Moses wrote Genesis; Paul wrote Hebrews; or whether Isaiah is the author of the whole book of Isaiah.36 In this regard it has the capacity to enable us to “respond to scripture itself by being critical of received theories regarding the origin, nature, and meaning”37 of scripture. In other words, partially at least, it has helped us pull back the veil of our previous assumptions and enables us to listen to the text itself. In conclusion, we must take the historical rootedness of the biblical text seriously whilst also alert to the danger of letting the detail of historical minutiae sidetrack us from the central task of exegeting the text. If we are to explore the Bible’s historical context we simply cannot reject the historical-critical enterprise entirely. In the light of the criticisms of the method identified here and elsewhere, however, we must be careful not to assign the method “a primary and foundational role.”45 As interpreters, we must know ourselves well – our worldview and presuppositions – so that we can deploy historical-critical insights intelligently alongside the wider corpus of modern interpretive tools. Can preaching a dud sermon be the godly thing to do? I want my preaching to be faithful, clear, passionate and provocative… But I’m also aware that I want people to think highly of me. I’m tempted to run after their praise. And because of that I’m inclined to be a perfectionist. I recognise this tension in me a lot. Anything I do, I want to do well. I want to serve people well in my preaching, yet this seems inextricably bound to the desire for others to think highly of me. 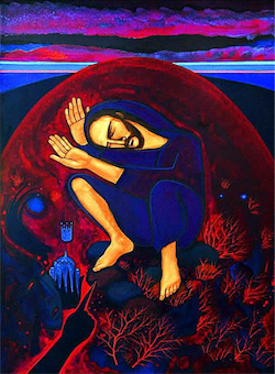 I have been reading the temptation of Jesus in the wilderness as told by Matthew 4v1–11 today, and have been finding Tom Wright’s discussion of the passage1 really helpful. He is committed to loving and serving God alone. The flesh may scream for satisfaction; the world may beckon seductively; the devil himself may offer undreamed-of power; but Israel’s loving God, the one Jesus knew as father, offered the reality of what it meant to be human, to be a true Israelite, to be the Messiah. So what about me? When I fast, I am faced with some very base choices and temptations. Voices whisper in my head that this is all silly, a meaningless exercise, a needless experiment in self-deprivation. Yet in choosing to deny these whispers, I am choosing to remind myself of how often I give in to the other whispers in my life. They are intended to distract me from my calling and vocation to be a servant of God. I choose as I fast to let my body echo my true desire (albeit often well hidden) to win the battle against Satan that wages in my mind over the subtler temptations I give into daily. For in choosing to give into these, I know that I am allowing my true vocation to be distorted, to allow myself to get distracted, turning aside from the path of servanthood to which I am commissioned. Yet this commissioning is often a simpler process than I like to imagine. I recognise that my own reliance on God is often more about big picture stuff rather than a daily reliance on him. I have a tendency to always be looking at the ‘big picture’ of where God is taking me in life and what God is doing, at the expense of what he is asking me to do right now. It takes a lot of my spiritual energy. As I fast, I am being painfully taught the need for a daily reliance on God. Focussing on what God wants me to do today – not tomorrow, next year or in a decade – today. I recognise more and more that the trajectory of my life, expressed in the daily conscious and unconscious decisions that I make, is in need of continual realignment to the plans and purposes of God. What kind of child of God am I? Am I the kind of child that trusts God to meet my needs? The kind of child that trusts that when the Father says he’ll give me good gifts, that he’ll give me just that, and not a scorpion or a rock? What I do know, is that I’m trying to step towards God’s purposes. One day at a time. Our week of 24-7 Prayer kicks off tomorrow. We’re looking to set ourselves up well for 2009. If you haven’t caught on to the 24-7 thing, where have you been? Check out a short intro in the video embedded here. See 24-7shorts.com and 24-7prayer.com for more info. Whilst I’m on a Greek and an iPhone App roll, I thought I’d introduce you to another iPhone App that I have been using recently that has enhanced my Greek study no end. 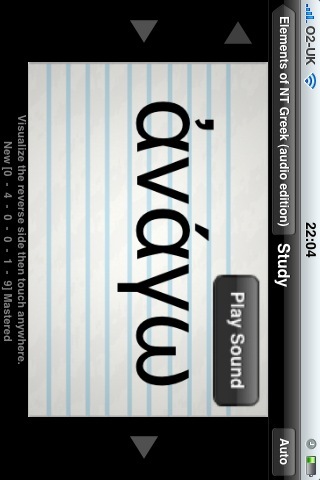 As soon as the App store became available I was aware of the possibility of using my iPhone to aid my Greek study. I held off, thinking that written memory cards suited me just fine. Eventually I caved in however, and have been happily using ‘Flash My Brain’ for several months now. 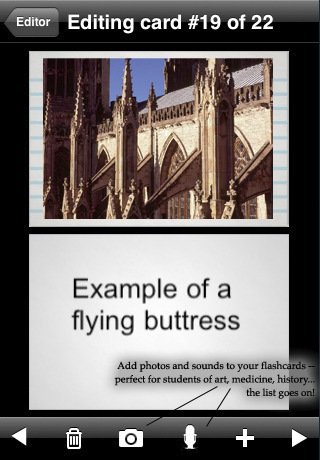 There are now an impressive array of flashcard apps available for the iPhone – but in my view, this one beats them hands down for biblical Greek study. I have uploaded all of the 600 vocabulary words used in Jeremy Duff’s ‘Elements of New Testament Greek’, including one version that includes audio helps for each of the words. Hopefully the somewhat poorly shot embedded video demonstrates something of the feel of the App…! I have found that the Leitner memorisation system and customisable shuffling incorporated as options have made my learning more systematic and works really very well for me. The online card view system makes it really easy for you, if you wish, to make your flashcard sets available for other users to access. Last time I checked, there were 243 different cardsets just for Greek vocab and grammar that people had uploaded and made available through the online server – with many hundreds more in everything from taxes to Tibetan to time tables! Whilst I guess most people have specific and individual requirements when it comes to their flashcard content, there is so much good stuff available on there that it does deserve a mention. You can take photos with the iPhone’s camera, or add photos from your saved albums on both the iPhone and iPod Touch – you can even then slice them up and use bits from the front and back of your cards. I have added sound recordings to my flash cards that can be set to automatically play or play on my command (see embedded video for an example of this). This I find really useful as I have both the visual reminder of the word with an audio pronunciation right there to reinforce it. However, the editing process through the iPhone editor can prove to be a little time consuming. If you’re prepared to shell out for the desktop version, you’ll find that it seamlessly integrates with you iPhone and makes the process of creating cards SO much easier! Having created over 600 now, I don’t think I would have managed just using the built in iPhone editor, even though it is very good. It’s always on you! 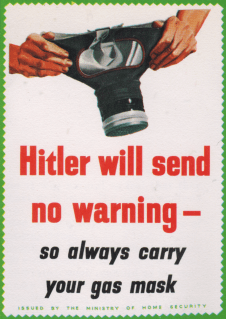 (well, always on me anyway). Whether I’m on the train, walking out and about or lying in bed, I can always reach for my phone and have my vocab easy to hand. Fantastic! A cheaper price! 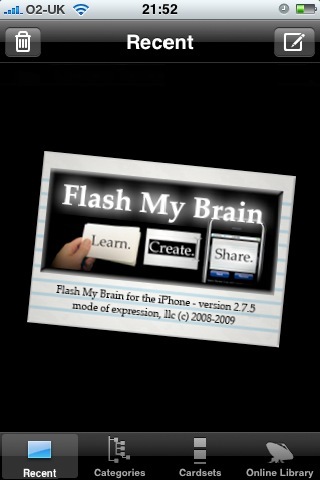 ‘Flash my Brain’ for the PC or Mac weighs in at $29.95, with the iPhone App setting you back $5.99 currently. Whilst these apps are the best in their market imo, they are still a little pricey. 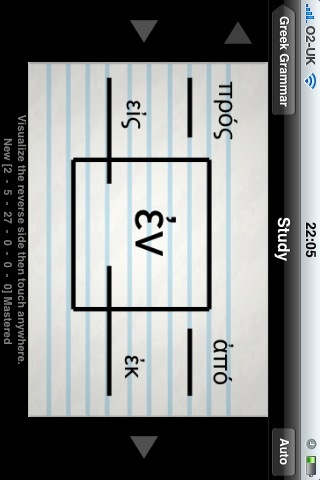 The font used to display Greek text on the iPhone is readable, but ugly. To be fair, I guess this is the fault of the current iPhone software for not supporting more attractive fonts for biblical Greek study so this may change in the future. I’d like there to be some kind of free uploader available so that users can easily upload their own cards without being reliant on either using the iPhone editor (laborious) owning the PC / Mac version (expensive).